Above is a photo of my son's bedside table. 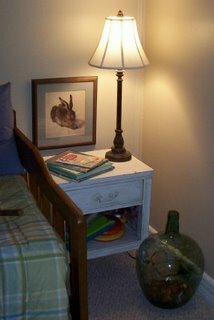 Normally, I like to use wall-mounted lights for kids' rooms because lamps won't get knocked over or take up valuable play space. However, this room has awkward spots that just fit two extra tables sitting in the garage! They'll be painted green later. The grouping needed a third element to connect the tall lamp visually to the table. I've always liked hanging pictures low as a clutter-free solution. In fact, Montessori mama Barbara Curtis insists it's a must for kid-friendly rooms. My mom bought this rabbit print for $2 at Goodwill today. I love its realistic depiction, one that's artistic without being feminine. I think it looks great in its new home--and the tabletop is still free for books and that nightly glass of water. If you have a small picture, don't float it in the middle of a blank wall. 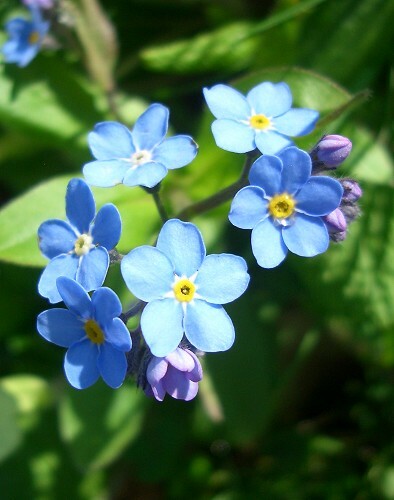 Try hanging it just over a chest or bedside table. 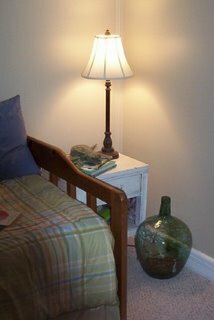 If possible, position the top just below the edge of a lampshade, where a pool of light will make it shine. That is so perfect! I have the same Durer print and I agree - it is a wonderful choice for children. I love how it's so obvious that God is assisting you every step of the way in your decorating! I call that "anointed shopping!" Ha! "Anointed shopping" is a great phrase! You and Barbara are really inspiring me to rethink the little ones' rooms. I've tried to hang soft things lower, but the glass frames are up high and can only be seen at eye-level if they stand on the bed. My youngest just turned 2, and my oldest is not yet 4. They are always asking me to pick them up to show them family pictures. I really like the bunny picture!